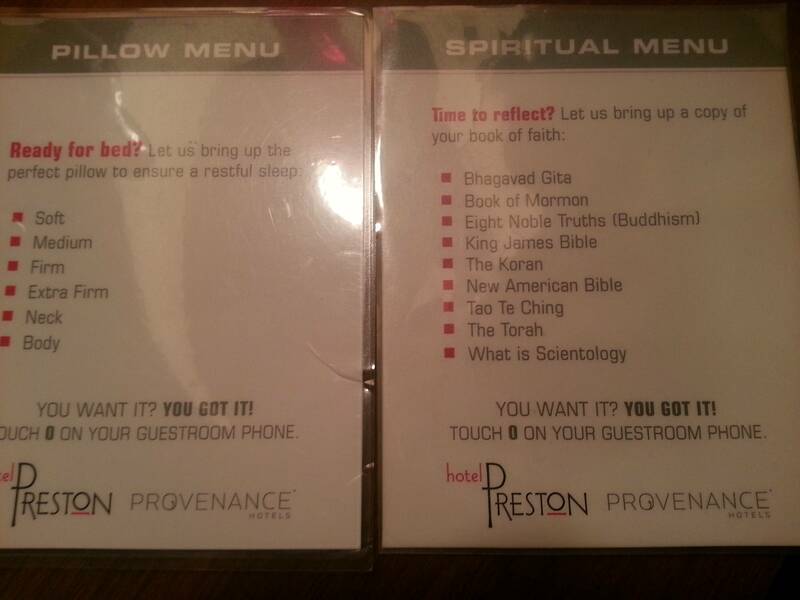 It comes from the Hotel Preston, in Nashville Tennessee. According to a number of sources the menu on the right (though the pillow menu looks pretty nice too), is the brain-child of Howard Jacobs, the chief operating officer for Provenance Hotels, the owner of the Hotel Preston. 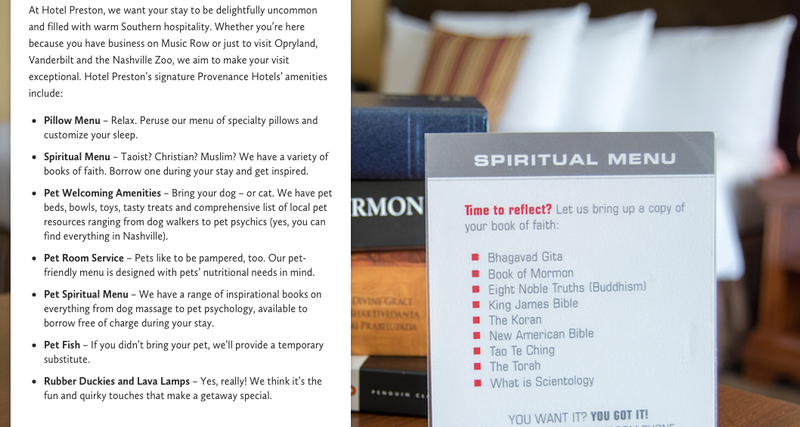 While this is a very clever (and more than likely quite successful) marketing scheme, the Spiritual Menu might be helpful in another way, particularly concerning how we approach and study ‘religion.’ My intention with it, then, will be to use it as an alternative methodological approach to researching and teaching ‘religion’ beyond the limits of the normative ‘World Religions Paradigm.’ To do this, however, I need to first provide some background on the latter. When I decided to ‘return’ to school after a few years working full time, one of the first courses I took was an ‘Intro to Religion.’ Though it would become the subject to which I would devote my scholarly energies from that point on, I was a bit anxious about this course. I had a fairly poor experience the first time I tried to attend university, and one of the first courses I took then was also on the ‘World’s Religions.’ In this version, the instructor spent most of his time showing pictures of himself standing in front of Buddhist Temples. I ended up failing the class because I stopped attending. My second experience was much better. In fact, I might even go so far as to blame this course for the route that my academic interests would take. 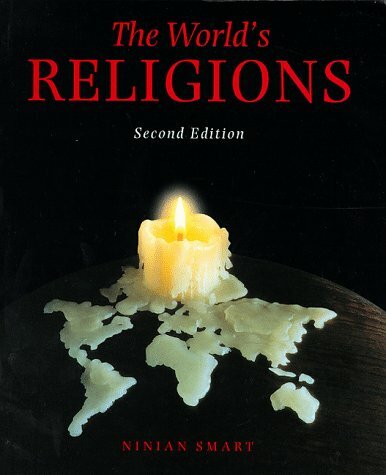 For this class we were assigned a single text: Huston Smith’s The World’s Religions. I loved this book (and still do). I was enthralled by Smith’s narrative, by the way he introduced ‘religion’ via stories, summarising a millennia of beliefs and practices into short and practical explanations. The text is simple: a somewhat reflexive introduction followed by a Chapter each on Hinduism, Buddhism, Confucianism, Taoism, Islam, Judaism, Christianity, Primal Religions, and a Conclusion about the interrelatedness of religious belief told through narratives and stories across thousands of years of human cultural development. For me, the text’s simplicity was ideal for my introduction to religion. 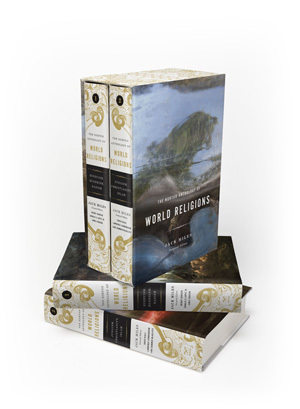 Here were the ‘world’s religion,’ in simple prose, presented as they occurred in the real world, almost progressively, like an evolutionary system of socio-cultural belief leading toward some sort of conclusion. 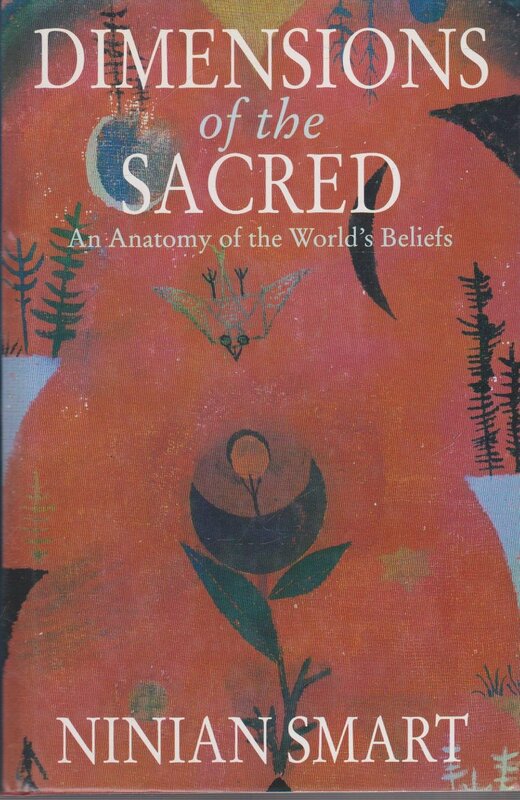 A few years later, when I was working on my first Master’s degree in Religious Studies, I was introduced to Ninian Smart’s Dimensions of the Sacred, which also introduced me to his own The World’s Religions. 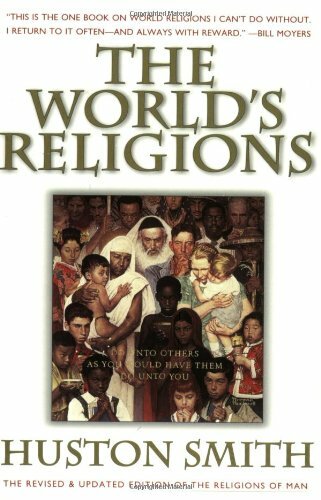 While the former introduced me to a theoretical world of functionalist approaches to the ‘meaning’ of religion, the latter seemed a rather more complex version of Smith’s World’s Religions. I didn’t think much of it, but it did indeed assist me in growing my knowledge about the subject. Again, this seems like a fairly straight-forward text, offering primary source ‘voices’ with which to tell the story of these ‘religions.’ However, and as I too came to realise over my years of studying religion, this is not without its faults. For example, while this makes the job of teaching about religion slightly easier (if not more marketable), it also quite simplistically isolates the concept of ‘religion’ into a particular six-to-seven part typography. Likewise, this presents the issue of a normative or ‘western-centric’ perspective, so that ‘religion’ is thus defined here by our isolating it to these particular cases. This becomes even more problematic when we begin to study ‘religious beliefs and practices’ that might not fit into these typographies, such as Scientology or ‘New Age.’ Which, as we might argue from the outset, moves us outside of the realm of strict objectivity by underscoring our intentions with preconceived notions about what ‘religion means’ before we’ve even had the chance to discuss it. As well, the brilliant minds behind the Religious Studies Project (David G. Robertson and Christopher R. Cotter) have a forthcoming text on the subject set to be released in the very near future. As she states here, not only does it cause issues concerning the way that ‘religion’ is presented in the classroom, and is thus perceived by students (such as myself), using this paradigm also affects the discourse beyond the classroom. In the British case (the context within which she is writing) this translates into a public perception that further normativizes the notion that ‘religion’ is something that consists of an ‘us vs. them’ binary. What this further produces is a somewhat inherent bias that not only raises certain ‘religious beliefs and practices’ above others, but that equally denigrates others that don’t fit into this sort of typography. While on the surface it appears to divide ‘the spiritual,’ which we might translate as ‘religion,’ along similar lines of the World Religions Paradigm’s promotion of ‘popular religions’ (Judaism, Christianity, Islam, Taoism, Hinduism, Buddhism, Scientology), it is doing so by means of textual narratives, such as we see in the Norton Anthology. This is similar as well to the use of narratives in Smith’s and Smart’s World Religions. In this way, ‘religion’ is presented via narrative representations, much like Smart’s dimensions in regard to the ‘mythology’ or ‘doctrine’ that underscores a definitive aspect of religious belief and practice. Said otherwise, these are presented via particular discourses. Thus, rather than seeing the texts offered in the Menu as furthering the notion that the best means of presenting ‘religion’ is done though a typography divided by the World Religions Paradigm, they can instead be reflective of particular discourses pertaining to how individuals might define themselves ‘discursively’ via myth and doctrine. What I might also argue from this line of thinking is where the contributors of the Norton Anthology might have ‘gone astray,’ beyond the idea that the religions they present have the bizarre ability to “speak to readers in their own words,” is not so much found in their using discourse as a means of allowing the ‘subject’ to speak for itself, but in their isolating this discourse within a paradigm at all. The ‘Menu’ is thus nothing more than a discursive sampler: texts used by individuals that represent, on one end, the discourses we might see as ‘underscoring’ a ‘religion,’ that on the other are used by individuals identifying with that ‘religion.’ In the same way, these texts are not the religion itself. The Bhagavad Gita is not Hinduism. What is Scientology is not Scientology. Rather, they are narrative representations filled with language used by individuals in their processes of identity construction. Therefore, unlike where the Norton Anthology uses similar ‘primary sources’ to describe how a religion might ‘speak for itself,’ the use of the menu here gives us a much more clear and nuanced look at how individuals might use a similar source in order to shape the language they use to describe themselves ‘religiously.’ In other words: a Scientologist might use What is Scientology to describe him or herself as a Scientologist; the book is a discursive tool, not the discourse itself. Thus, again, while the means with which those who use the World Religions Paradigm is not inherently problematic, their doing this within the confines of a paradigm that provides a normative and biased position on the meaning of ‘religion’ confuses their intentions by turning their attention to the religion describing itself, rather than the religious individually describing themselves from within the context of that religion. This is, as well, quite contrary to the objectivity necessary of religious scholarship. Or, as I might argue: by translating the mythological and doctrinal narratives that are used by individuals in the process of their ‘religious identity construction’ as a ‘menu,’ through which they isolate their own discursive understandings of ‘religion,’ we can form a much more complex and varied person-to-person perspective on how individuals use, and thus define, the concept for their own intentions. Which, I believe, seems much more in keeping with the culture of religious studies.